A man working on a roof suffers cardiac arrest on Wednesday morning. A sheriff's office captain grabbed an AED and performed CPR until firefighters arrived. 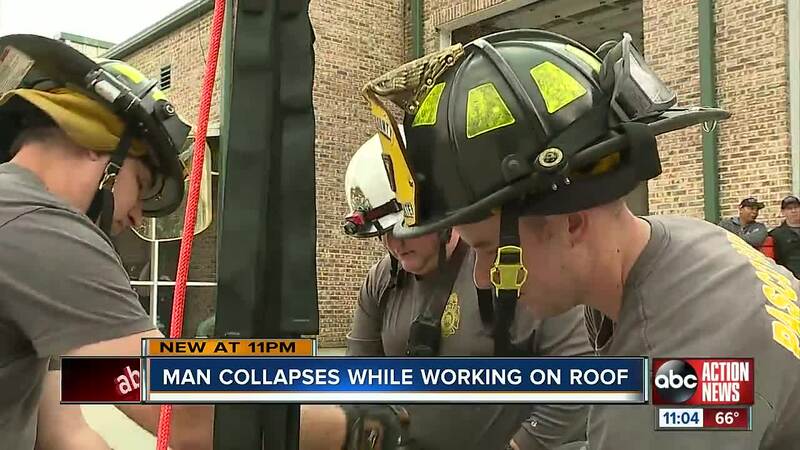 TAMPA, Fla. — Pasco County Fire pulled off a unique save after they got a call about a man who collapsed on a roof while doing work. Firefighters responded to the Pasco County Sheriff's Office Forensics building where the man was working with other private contractors when he suffered cardiac arrest. "I learned he had fallen and he wasn't breathing, but he was up on the roof. I thought it may be a cardiac issue. I got on the radio to get a hold of our friends with Pasco County Fire Rescue," said Captain Chris Beaman with the Pasco County Sheriff's Office. Captain Chris Beaman works in the forensics building and was outside on the phone when he heard people screaming for help. Beaman grabbed an AED, an automated external defibrillator, and got onto the roof of the building. "The gentleman looked like he was in pretty bad shape. He was blue in the face, the head and the face area. He didn't have a pulse that I could feel," said Captain Chris Beaman. Beaman started CPR on the man until firefighters arrived on scene. Cary Epperson with Pasco County Fire Rescue assisted with a high angle rescue. Firefighters placed the patient in a basket and removed him from the roof of the building. "If we took him down a regular ladder, he could of fell, we could have fell, got hurt and a medical issue could have turned into a traumatic issue," said Cary Epperson. Pasco County Fire Rescue said fast CPR and use of an AED leads to the best possible outcome for patients suffering from cardiac arrest. "It saved this guy's life today. It's not the first time and it's not going to be the last time. The quicker you can get an AED on somebody — there at all public buildings. The more people trained, the more lives that are going to be saved," said Epperson. Patient privacy laws do not allow us to get details on the patient involved in Wednesday's rescue. Firefighters said he was conscious and breathing when he was taken by ambulance to a local hospital.